Disney laid off the entire staff and shuttered the studio this morning. There had been speculation that LucasArts might be liquidated after Disney acquired Lucasfilm and the other companies beneath its umbrella five months ago. The video game studio had been flailing in recent years despite moderate successes like LEGO Star Wars. On the other hand there were turkeys like Kinect Star Wars. It had been hoped that games like the upcoming Star Wars: 1313 would have increased its fortunes. 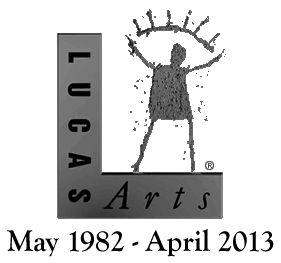 But now it's official: LucasArts has been closed down. Disney has stated that future games will be licensed to other studios for development. Some like Star Wars: 1313 may never get released at all. The "LucasArts" name will continue to exist but the firm itself and its development staff has been disbanded. Even so, a little bit of my youth died today. Star Wars: X-Wing was the very first computer game that I bought, way back in winter of 1994. The sequel TIE Fighter consumed most of my summer a few months later. When I played Indiana Jones and the Fate of Atlantis (still one of THE BEST computer role-playing games ever) I obsessively went through all three of the "paths" that Indy could take. To say nothing of the creatively offbeat games like Full Throttle and Sam and Max Hit the Road. Well, the studio may be gone. But the memories it evoked will ever burn bright.